Adamant Barbell has been providing high quality fitness equipment for universities, colleges and high schools since 2007. We have supplied schools with everything from power racks to cable machine attachments to agility training tools. As long as you're a government-funded institution, we can always take a purchase order, by email, fax or postal mail. We can put together quick quotes for your school's approval. We have worked with schools who needed delivery in a month or two when school is on vacation and the staff has time to set up equipment. No problem! For your high school weight room you can get by with lower-grade equipment than colleges and universities would need, and you'll save on your budget. Kids can be rough on equipment when they're horsing around, so for a high school you need equipment that is meant to be used regularly. You don't want benches that you can find at a discount sporting goods store. That would be a serious safety concern. 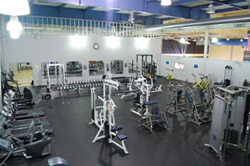 Power racks and other equipment should also be heavy duty enough that they won't tip over easily. Contact us to be sure you're getting the right equipment. 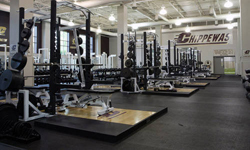 High-profile universities have some of the best weight rooms and sports-training facilities in the country, with plenty of equipment to accommodate a whole sports team doing the same exercises together. We know our stuff. We know which olympic bars are suitable for major university gyms that host the best college sports teams, and what bars are plenty good enough to stand abuse by students in a smaller college or high school gym. We know what squat racks are ok for home use but are not appropriate for multi-user environments or would look out of place in a high-end gym. If you don't know what to get and you're working with little more than some scribbled notes from your athletic director, we'll figure out what you need and tell you all about it. We understand that your coach or athletics coordinator doesn't have time to hand unload 2000 lbs of equipment from the back of a delivery truck. If your facility doesn't have a loading dock, we make sure the truck has a lift gate so that the driver can wheel the pallets right up to the gym.